Well, on a serious note, Windows 7 extended support will end in 2020, so no more updates. Even now Microsoft is releasing major fixes only. Having seen how much is XP targeted by malicious software rest assured that W7 will have the same treatment and I'd suggest to change to a still maintained operating system before that date or otherwise isolate the PC from the net. If there is need of an old software that runs only with an old operating system, which is usually the reason why someone is stuck with it, running a virtual machine with VirtualBox or similar is a preferable solution. If you're stuck with a computer that cannot support Windows versions newer than 7, Linux and opensource software will extend its lifetime until an ultimate hardware failure will happen. This from a general point of view, a gamer's choice is not that flexible anyway, game producers need to keep up with newer operating systems. All the more, Microsoft aggressive stance on W10 adoption makes its point of view on older software (and pirated contents) crystal clear. As for me, the moment I'll find a way to make use of the Nvidia graphic chipset in my laptop with my beloved linux distribution, I'll evaluate SE performances under Wine emulation and if I'll be satisfied, bye bye Windows 10. I am considering also to switch to Linux. 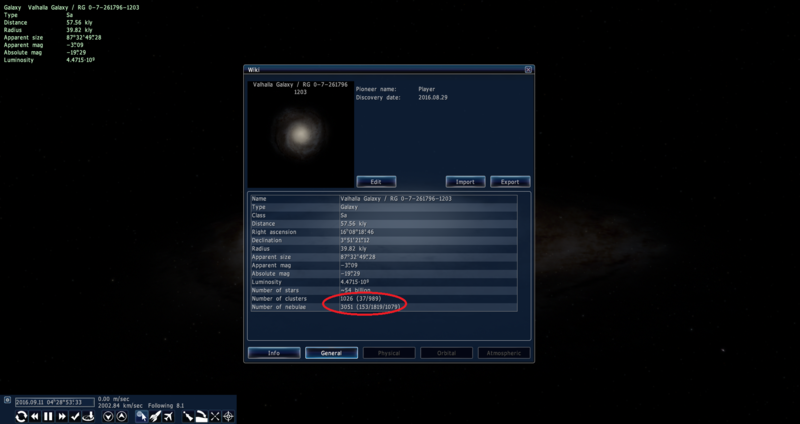 And by 2020 there might be a Linux version of SpaceEngine! Question, is there a tag to modify ocean albedo or something? I was playing around with a mod and then all of sudden the ocean became so reflective it was like a mirror. Will there be the fascinating cloudscapes planned for the gaseous giant planets like Jupiter, Neptune and exoplanets at various altitudes in hydrogen/helium atmospheres? Imagine about flying over or under ammonia clouds, ammonium hydrosufide clouds, water / aqueous ammonia clouds and methane clouds many kilometers higher above the lower atmospheric featureless global fog- where the probe or ramscoop may dare to go. intelligent life is possible within space engine? Is there an absolute maximum number of objects the Space Engine can procedurally generate? Like hypothetically if each and every single procedural galaxy were given a radius of 50 kiloparsecs and changed to a class of E0, would the game run out of "room" to generate new objects inside them? would the game run out of "room" to generate new objects inside them? No. There's no room to speak of, technically, since procedural generation implies generating space along with it's content. Space Engineer could have made the universe virtually limitless in the game, but that would take a heavy load on coordinate system he is using. It is difficult to imagine, but since the game already generates trillions of galaxies with billions of stars, this is far beyond anyone's ability to grasp it's scale. Hello, I picked SE back after a while since the new update came out and started reading about the game that's going to be based on the engine. - If the game isn't free, will it be a monthly subscription or a single payment? - I've read somewhere that future versions of the planetarium will include an integrated spaceship editor, I never found that post again (it might've been on reddit), is that actually true? Or maybe it's a feature that the game will have? - If the editor won't be included, will the future versions of the planetarium, the ones coming after the release of the game, still contain every single aspect of the current version, such as spaceships? Or will they be pulled out? - If they won't be pulled out, will the spaceships have an actual collision detection by the time the game/the 1.0 version of the engine is released? - Is the game actually going to be multiplayer, singleplayer or both? - Will the planetarium still be updated once the game is released, or will it just be used as a 'demo' to the game? Game will be paid. Maybe even planetarium too. I need an order of magnitude more income, to be able to hire some programmers and artists. Without it, SE development will be even more slow than now, because the program become more and more complex. Probably single payment, plus some in-game purchases - it is a common thread nowadays. Yes, it will be a feature of the game. Planetarium don't need controllable ships. It will have only some real spacecraft - ISS, Hubble, some probes, on a static orbits/trajectories, uncontrollable by user. In the game, of course they will have collision detection and other physics aspects. Les make a single-player game first. It's not hard to add some social features like shared database of discoveries or player achievements with leaderboards, so it will be kinda multiplayer. Planetarium will be a separate software. It may share some resources with the game (like planet textures packs), or maybe not. Nvm: Foot in my mouth again. Is it possible to orient the ship using right ascension and declination (from earth)? Is it possible to run multiple addons simultaneously? Some addons (like Klud's modification of the mountains and modification of asteroids and selenes) share some file (in those mentioned, for example, the tg_common.glsl file). So the file that works is the one of the last mod installed. There is a way to mantain all the "effects" of all the mods? 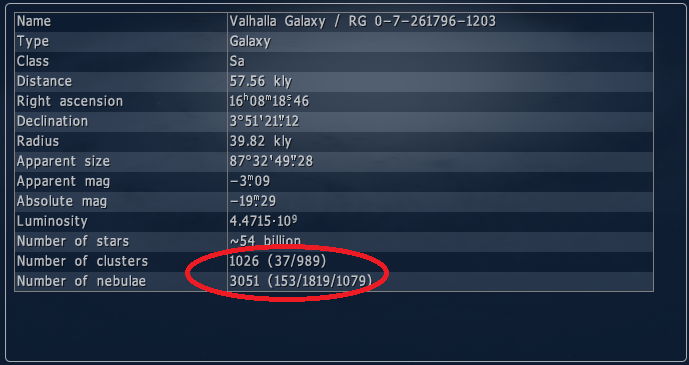 Exactly how many kilometers does the game count as 1 au? I keep thinking it is 149597870.7 km. Is this correct or no? Ok, I tried to found information about this earlier without success. With the in-game wiki feature, we can get a lot of specifications about the object we are looking at. But, some of the numbers are not explained (or am I completely fool). Please don't judge me for the name, it's the best name a galaxy could have. I'm looking at the surrounded numbers (those in parenthesis). The numbers for clusters are easy to guess by randomly selecting clusters with F3. The left number stands for globular clusters and the right one for open clusters. I'm not a native english speaker. If I make a big mistake, feel free to tell me so I can fix it and improve myself. In the picture are 12 star nebula. Four diffuse and eighth planetary. No supernova remnants.